A sixth consecutive quarterly rise in construction activity has been reported for 2014 Q3 by the Construction Products Association, with a slow-down in private housing output offset by growth in all other sectors. 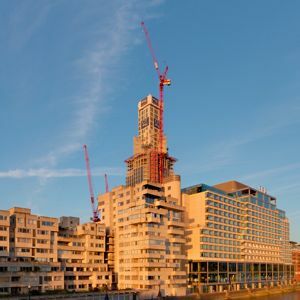 The Association’s latest Construction Trade Survey saw 60% of building contractors report, on balance, that construction output rose in the third quarter of 2014 compared with a year ago. 43% of firms reported growth in the largest construction sector, private commercial, which covers offices and retail work. Meanwhile a further 41% of respondents said output had increased in the private industrial sector, including factories and warehouses construction. However private housing activity slowed in Q3 as 35% of firms surveyed reported a rise in output compared with 57% in Q1 and 41% in Q2. The Trade Survey also shows construction firms reported rises in ‘forward looking indicators’ such as orders and enquiries, foreshadowing a potential rise in activity throughout 2015. This included a rise in Q3 order books in private housing for 15% of contractors, while 13% and 12% of firms reported rises in orders across private industrial and public non-housing respectively. 11% of respondents experienced a fall in margins in Q3 compared with Q2. The survey saw 68% report rise in labour costs and 74% say that materials costs rose in Q3 compared with the previous quarter.